The autumn blaze maple tree will grow to fifty or sixty feet tall and have a mature spread of thirty to forty feet. They are not a susceptible to storm damage as the silver maple, as they received stronger wood from their red maple parent. The autumn blaze maple tree also has the ability to grow in most soil conditions. Named Urban Tree of the Year in 2003, the autumn blaze maple tree is patented by the late Glenn Jeffers of north central Ohio. The autumn blaze maple tree has recently become one of the most requested trees in the United States and is quickly growing in popularity in other countries as well. It is especially asked for because it has the vigor and adaptability of the silver maple, as well as the strength and beauty of the red maple. Iowa's Nursery and Landscape Association named the autumn blaze maple tree Tree of the Year. The leaves of the autumn blaze maple tree resemble the leaves of a silver maple tree, being opposite, simple, and five-lobed with toothy margins. The deep red veins of the leaves are derived from the red maple. 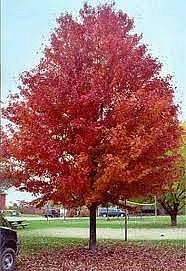 The summer color of the autumn blaze maple tree is a rich medium green, which turns into orange and crimson in the fall. 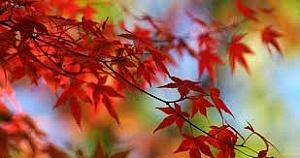 The leaves of the autumn blaze maple tree will last longer on the branch than those of other maple trees. An autumn blaze maple tree works perfectly as a specimen tree, can also be used in clusters.